Trekking is the most popular adventure activity in the world. Many adventure enthusiasts trove their way to Himalayas in their holidays. During the trekking, trekkers love to accommodate in a camp which is a different experience with the great fun. For trekking to Himalayas, you need to have a good health condition or physically you should be strong to walk ups and downs through the mountain road, jungles, valleys and terraced paddy fields. Nepal, the small landlocked country in the south Asia in between two giant countries India and China, is a Himalayan country with the highest mountain peaks including Mount Everest. In Nepal, tea houses or mountain lodges are not available to a high elevation. So, you need to stay in a camp or there might be camping type of trekking. Here, we are listing the most popular three camping treks that receives highest number of trekkers throughout the year. Situated at the foothills of World's highest Mountain Peak, Mt. 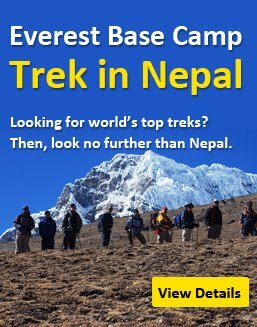 Everest, Everest Base camp is the world famous camping trek in Nepal. Every trekkers who dream for Everest, go to its base camp. Those who are not able to climb to the summit of Mount Everest, go upto its base camp and return back. Trekking to base camp of Mount Everest is not a easy task as it is considered as the challenging trek in Nepal. You will have a wonderful lifetime experience to witness the Mountains that you really dream for. Annapurna Trekking or Annapurna base camp trek is another popular trek in Nepal after Everest base camp. Trekking to Annapurna is a greatest achivable for many trekkers because of mountain scenery, culture, ethnic villages and rhododendron forest. On average, Annapurna base camp trekking is of 12 days. Manaslu trekking is one of the most popular wilderness trekking trail in Nepal. Because of ethnic villages, culture and remoteness, this trekking hase gain popularity among the trekkers all over the world. Generally, it takes around 15-17 days to complete the trek but if you add Tsum Valley, it takes 7 more days.